Another quick Luminar tutorial for you guys today, and this time we’re looking at how to open RAW files. Just like Lightroom, Luminar is a fully fledged RAW photo editor but unless you open the RAW files directly into Luminar from your file browser, it can be a little confusing. If you don’t do things quite right you might end up editing a converted TIFF of your image, instead of the original RAW file. This would definitely degrade the final image quality and you wouldn’t be pulling all of the available dynamic range out of the RAW file. Find your RAW file within the file browser of your operating system, and simply drag the file onto the Luminar logo in you application folder or app launcher. This way is simple, but if you’ve got a lot of RAW files from your shoot, it’s hard to browse them easily in the file browser because you can’t closely examine the variations in similar photos. Continuously opening individual RAW files in Luminar is not the way to go, you’ll be there all day because it takes some time to open an image. So this works, but at the moment it’s not an ideal workflow. NOTE: In 2018 Skylum Software will be launching an asset management update for Luminar which will give it many of the folder and photo management capabilities in Lightroom. 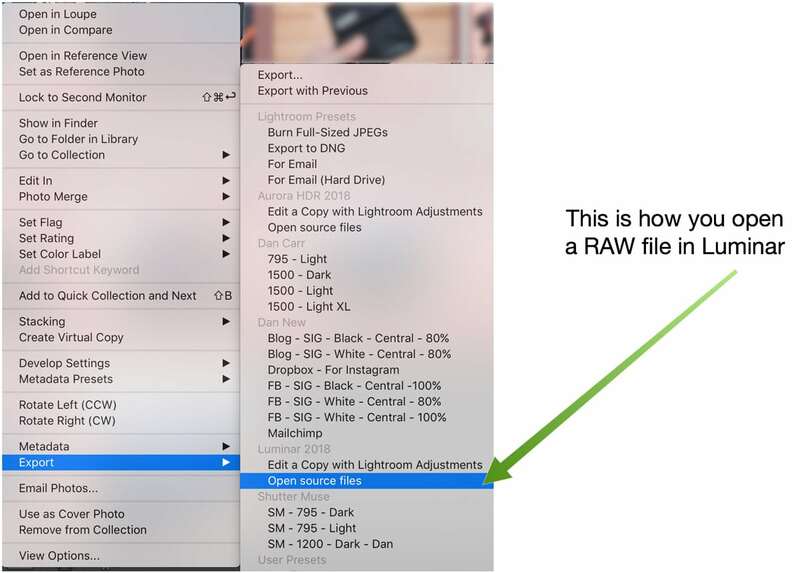 At this point, the whole RAW opening process will become a bit easier, and methods #1 and #2 from this list of 3 will become obsolete because you’ll simply be able to browse your RAW files within Luminar. Thankfully, if you buy Luminar now, the asset management will be available for free when its ready. With Luminar open, simply go to the file menu and click the open command, then browse to your RAW file and select it. Much like method #1, this works, but it’s a cumbersome way to choose a single RAW file from a folder of similar looking images. If anything, it’s actually harder to do than method #1 because the browse window for the files you want to open is smaller. A lot of people are still using Lightroom Classic to manage their image folders and collections, and then processing the files using Luminar. When you do this you have a choice to make. The first option is to decide to open a RAW file directly into Luminar, without having made any changes at all using Lightroom’s develop module. The second option is to make some changes within Lightroom, and then open your image as a TIFF file in Luminar to apply additional changes. 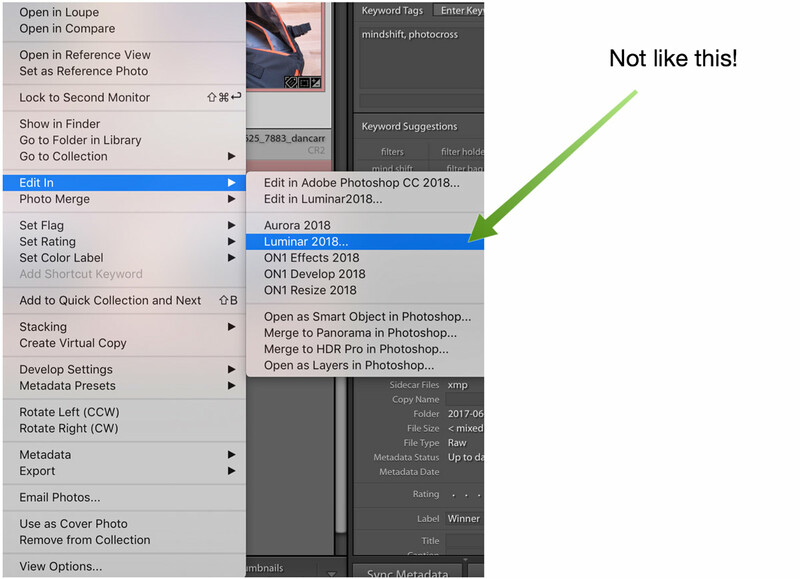 What you cannot do is make changes within Lightroom, and then open that as a RAW file into Luminar – that’s simply not how RAW files work! A RAW file ceases to become a RAW file once you have made and saved changes to it. At this point, these changes have to be “baked” into a file in order to save them because you can’t save a RAW file. This is a terrible way to do things because by making a couple of minor tweaks in Lightroom, you are now forcing yourself to open the photo as a TIFF into Luminar. Once the TIFF is in Luminar, you’re making your tonal edits on a TIFF file and NOT a RAW file. The resulting dynamic range will not be as good, and you’ll likely introduce unnecessary noise into your photo which will require the noise reduction filter and therefore a loss of detail. 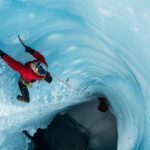 With this workflow, you have lost many of the benefits of shooting RAW. Apply special effects to the photo that are not available in Lightroom, such as using the sun ray filter from my previous tutorial. 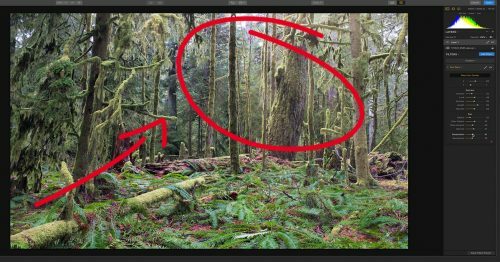 In this example, you’re basically using the RAW processing engine in Lightroom to do the heavy lifting on the RAW file, then using Luminar to do things that Lightroom simply can’t do. 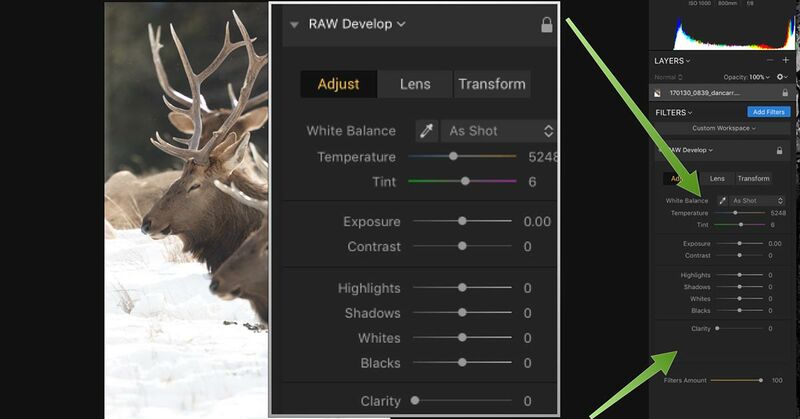 This is a similar method to how most people use Photoshop with Lightroom. 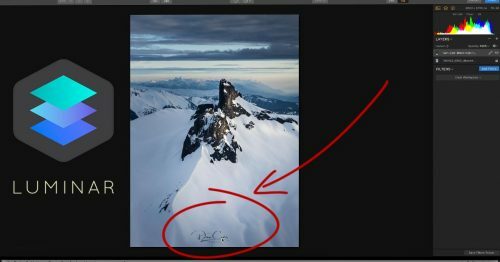 Process in Lightroom, and then use Photoshop for layer and masking activities – both things that can also be done in Luminar. There’s nothing really wrong with this workflow, it’s just important to understand how it is different to the first example. This third workflow is really the reason that I wrote this whole tutorial, and made the video. I know it might seem like a long build-up, but I want people to understand why we do things in a certain way, not just how. Ultimately I think it’s a much better way to learn, and it’ll help you navigate photo editing applications more ituitively in the future. With this workflow, we’re simply using Lightroom as a file browser, and using it to launch a RAW file in Luminar. You’ll know that you have done this correctly when the RAW Develop filter is available in the Luminar filter menu. If you have opened a non-RAW file in Luminar, the filter is simple called “Develop” not “RAW Develop”. The most important thing is that when you right-click the photo in Lightroom, you choose the “open source files” option from the Luminar Export options. If you choose “open a copy with Lightroom adjustments”, you’ll be converting the RAW file into a TIFF before applying the vital edits, just like example 1. Don’t do that! When I was first getting to grips with using Luminar in my workflow, the biggest RAW related confusion came from the fact that when you right-click on a photo in Lightroom, and go to the “Edit In” option, then choose Luminar, there is no option there to open the RAW file. 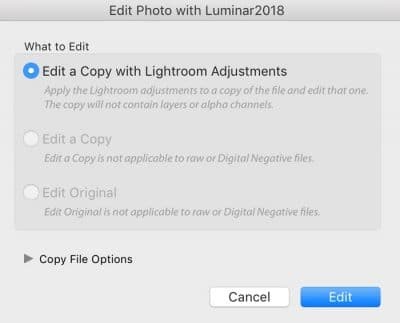 As you’ll see from the screenshot below, the only option there is to “Edit a copy with Lightroom adjustments” – all the other options are greyed out. 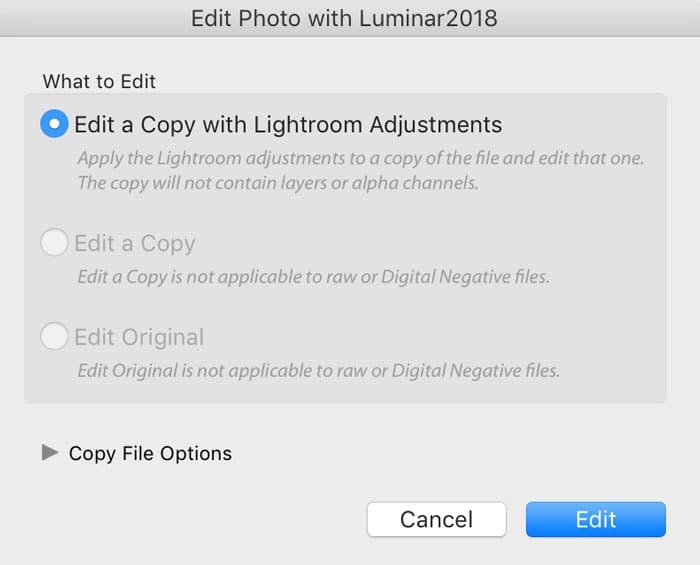 I would have expected the third option, “Edit Original”, to allow you to open the RAW file into Luminar, because this is how the process works when sending a RAW file to Photoshop. If you right-click on a photo in Lightroom and go to Edit In>>Luminar – there is no option to open the RAW file. I don’t know whether this is an oversight on the part of the Luminar developers, or perhaps they just don’t have access to that function as a plugin developer for Lightroom. Since I am so used to using the “Edit In” section of the right-click context menu it initially didn’t even occur to me to scroll down and find the Export>Luminar section where this “open source files” option exists. Hopefully this helps you guys figure out the best workflow for Lightroom and Luminar! I clearly did it all wrong until now. 🙂 Well, let’s head over and retry on some of my Luminar edits. Great post. I am sure many people will not know. But am really looking forward to the DAM, as I don’t like this “single photo editing”. Way too time consuming and reserved to my best pictures only. LR still seems quite a bit faster. Thanks for this amazing and clear explanation of workflow and correctly opening Raw files. I’ve been trying to figure out why I couldn’t access the RAW develop in Luminar, so this really helped. I had no idea about Export, as opposed to Edit In. You’re welcome! It had me confused for a while as well. Very good this, Dan, much appreciated. The commercial image library/agent I contribute to has to have original RAW files, something not possible with some softwares I’ve been considering that treat Fuji .raf files well but which convert to them DNG. I’m thinking of moving from Adobe to Luminar 18 but still using (temporarily) LR for image management so this is very encouraging. Thanks again. Thanks Dan, I’ve been playing with luminar for a short time and have wanted to layer mask a second image over a RAW image I imported from LR. 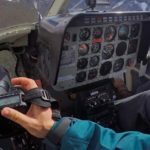 How can we bring over a second or more RAW images ? In that instance you would have to add a new image layer using the + button in the layers panel, and then manually select your second image using the Finder on your Mac or PC. When you say you cannot edit the RAW that is strictly true, but you can edit the RAW and leave the edits as a sidecar, this is how LR editing works on images and I wish Luminar worked the same way. If you work this way when you come back to the same image, you’ve got all the history and you can make tweaks. Luminar saves the file as a TIFF back into LR as a new image without any history. Why they don’t just save it back as a Luminar Project File is beyond me. This would work the same way as LR’s internal editing. Maybe they simply can’t do that as a plugin. Part of the issue there is that Lightroom isn’t a file browser. It can’t show all file types so it wouldn’t be able to display a Luminar Project File in the Lightroom Library. 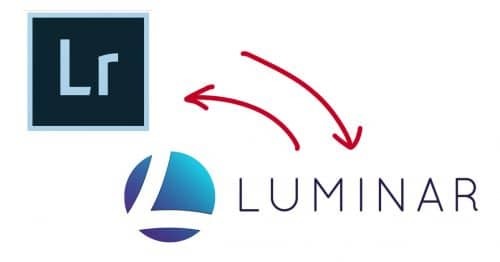 There’s no way Adobe will ever change that because Luminar is one of Lightroom’s biggest competitors and that’s about to be even more important when the Luminar Libraries features gets added shortly. So yes, it’s a plugin API access thing. 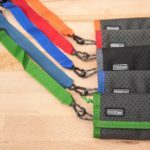 Plugins simply don’t have the ability to add other file types. To me that makes some sense because the idea is that any file in your Lightroom library can be edited in the Lightroom edit panel. If you could import Luminar files to it, they wouldn’t be editable and I think that would be confusing as heck for a of of people. 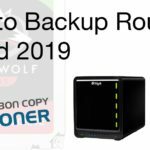 You are right though, it would be nice to have sidecar XMP from Luminar, but that said, it doesn’t mean it would be cross compatible with other software. You would not be able to take a luminar+xmp and open it in Lightroom and expect to see the same result because they have different editing tools.